The foundation of successful communication is first and foremost found in looking in the mirror. How does your spouse view you? What are the qualities that you possess as a spouse? All of this informs how your spouse will frame you in his or her mind, and it’s to your own advantage to keep this in mind when you’re not connecting. Then use that perspective to take a closer look at why. I have always wanted to be someone whom Nancy trusted, to have her feel safe with me. I wanted to be so positive in her mind that even when I blew it in communication, she could still see me as a trustworthy person to whom she wanted to be married. As we take this hard, close look in the mirror to see what our spouse sees in us, I’ve found three qualities are particularly worth paying attention to. The first is compassion. Compassion is accomplished through acceptance. It is the acceptance of another’s thoughts, feelings, and actions. It is letting them be who God created them to be and not trying to change them into who we want them to be. It took Nancy and me a long time to get this. I used to blame it on getting married young, but over the years I have seen people trying to change their spouse all the way to the retirement home. I grew up in a healthy, loving family. My parents deeply loved each other and were great role models. Nancy’s growing-up years in a dysfunctional home were difficult. It made perfect sense to me that my family should be our model. However, Nancy did not exactly see it that way— especially when I was trying to change her! Meanwhile, Nancy was trying to change me too. She put her dad on a pedestal. He was athletic and I was not. He was the life of the party and I was not. I could go on and on, but since I am writing this, I do not have to throw myself under the bus. She became critical of me because I did not fit her mold. So she spent years trying to change me. It never worked. Think about it for a minute. Do you want someone to come into your life and try to change you into the person they want you to be, or do you want someone in your life who loves you and accepts you as you are? That is compassion, and the acceptance it brings to a marriage will literally change the relationship. Nancy wanted me to accept her thoughts, feelings, and actions. She wanted to be able to tell me everything and have no fear of judgment. She wanted me to be able to love her as she was and let God make the changes in her that He wanted to make. I did not do that at first. In fact, I did not do that for a long time. Today I am better at it. Today she is better at it, and do you know what we discovered? That was God’s plan all along. God will never make me into anyone who is not perfect for Nancy or her into anyone not perfect for me. He values marriage too much. He wants our marriage to succeed and to be fulfilling. Whatever He does to bring about change in my life or hers will help accomplish that purpose. So accept each other. Accept your differences because you have them. You know something I have learned as a counselor sitting across from couples all these years? God NEVER puts two people together who are alike. NEVER. And to bridge those immense differences, you need compassion. You are different so you can grow and challenge each other and be able to say after fifty years of marriage that your life was so much better because you were married to him or married to her. Embrace your differences. Accept each other just as you are, and add compassion to your marriage. The second key to understanding how our spouse sees us is authenticity. It is not just what we say; authenticity is about how we say it. It is building a relationship over time that lets your spouse know that what you say is real and sincere. It is the assurance that you never have lied to or deceived your spouse, nor ever will. It is a combination of integrity, honesty, and a desire to honor God with your life. It is an incredible foundation that is rock solid. Let’s stop for a minute, because I don’t want to lose you. I can hear some of you saying, “I have already blown it. Is there hope for me?” The answer is yes, and here is why. I have blown it, too. In fact, I do not know anyone who has not blown it at one time or another in their marriage, but that is not a reason to lower the standard. If we begin to say this is okay or that is okay when they are not, what have we accomplished? We have just dumbed down marriage and devalued God’s plan. Even though it is high and difficult to attain, the standard needs to remain where God places it. We are all going to mess up at one time or another. When it happens, be quick to acknowledge your mistake, and then learn from it. Remember this: married life is a lot like being in a boot camp. Marriage is a time of learning and growing and figuring out how to honor God with our lives. At times the going is tough. Your spouse knows that you will not be perfect, or if they do not, they need to accept that fact. Nancy knows that I am not perfect. Yet she also wants to know that I am daily letting God mold me into who He wants me to be. When I blow it today, I quickly acknowledge what I did and take full responsibility. That is not easy. I used to acknowledge wrongs quickly but had trouble taking full responsibility for my actions. That needed to change. Then I asked God what He wanted me to do differently and what I needed to learn out of the experience. That put things in a different perspective. My accountability was now to God. That made a difference in me and in my marriage. That built a foundation of genuineness. When I take the time to ask those two questions, I connect better with Nancy. I am taking the time to “walk in her shoes” and taking the time to see how our perspectives are different. Then my response draws us together. She knows I care, and she knows I have taken the time and made the effort to understand her. The more I do this, the better our marriage. When was the last time you tried to put yourself in your spouse’s shoes? There are opportunities every day to do this. Start today. Ask God to show you an opportunity to be empathetic. Then do it. So compassion, authenticity, and empathy work together to lay the foundation of how your spouse views you. When I am totally in sync with these three, I am standing on solid ground in my marriage. Nancy experiences me accepting her unconditionally. She trusts what I tell her and knows that I would never knowingly do something to hurt her. Finally, the empathy I show lets her know that I have taken the time to walk in her shoes. Compassion, authenticity, and empathy work together to lay the foundation of how your spouse views you. When I am totally in sync with these, I am on solid ground in my marriage. No matter where your marriage is today, take time to look in the mirror. Ask yourself these questions. What does your spouse see? How are they interpreting your words and actions? What needs to change? As you begin to work on compassion, acceptance, and empathy, you will become aware of two minor miracles. You are placing your spouse firmly in the position God wants you to have him or her, and it keeps you building an awesome marriage. Those alone make that long look in the mirror worth it. 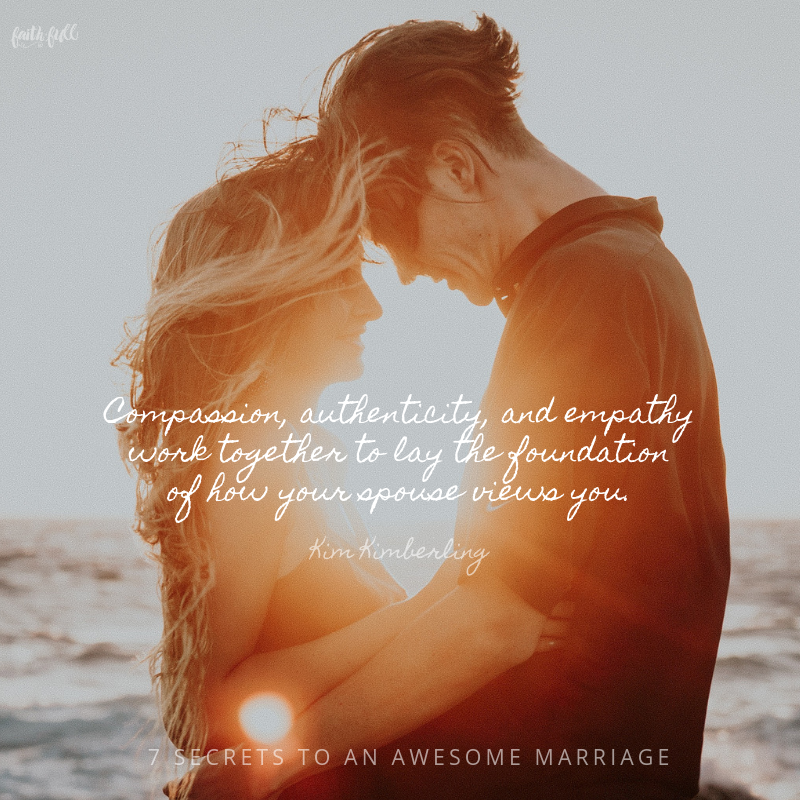 Excerpted with permission from 7 Secrets to an Awesome Marriage by Kim Kimberling, Ph.D., copyright Kim Kimberling, Ph.D.
What else do you think helps foster connection with your spouse? Join the conversation on our blog! We’d love to hear from you! Dr. Kimberling has been a professional counselor for over thirty years. He holds a Ph.D. and Doctor of Ministry in Christian Counseling. He also holds a Master’s Degree in Christian Ministry and Theological Studies. He is the president and co-founder of Family Christian Counseling in Oklahoma City. Dr. Kimberling is passionate about helping equip couples for marriage. He is the founder and leader of the Awesome Marriage Movement connecting people globally who want to have awesome marriages. He is also a professional Christian life coach and loves helping people close the gap between where they are and the life God has for them. Dr. Kimberling has been married to his wife Nancy for over forty years and they have two grown married children and five incredible grandchildren.